Now that you’ve gotten your hardwood floors you have to make sure they last you for a very long time, staying as beautiful as they were when you purchased them. There are a plethora of things you can do to make it last. Prevention and upkeep and making sure your hardwood floors stay pristine and give your home that warm feeling for time on end. While there are are many ways to do damage to your floor if you’re not careful and do not take into consideration the finish, vacuuming either daily or weekly is a harmless way to keep your floors looking good. You will get rid of the dust and dirt that could help a floor deteriorate over time. Make sure to turn off the beater bar and use any hardwood floor attachment. Rather than using a wet mop use a dust mop or a broom with exploded tips. These, according to Premiere Hardwood Floors, trap the dust and grime rather than simply spreading it out making sure your floors remain clean for longer. A spill is not necessarily the end of your hardwood floor as long as you’re able to clean it up swiftly, stopping it from setting into the wood. Keep paper towels on hand to make sure your floor continues to shine. Use a soft and dry (or at best damp) cloth or towel for best results. Shoes can bring in grime and dirt from the outside that can be hard to notice and deteriorate the wood. Likewise, the force from certain types of shoes can do damage to the wood of the floor, leavings marks and dents that can be very difficult to get out. A different type of finish can determine what strategies you should use to clean your floor. For example, a wax finish or an acrylic finish require varying strategies of care and different strategies for keeping the floors at their premium quality. Keeping a clean floor and making sure it lasts you longer is of the utmost importance, and with these strategies, ridding your floor of the unfortunate dirt and grime will be a snap. 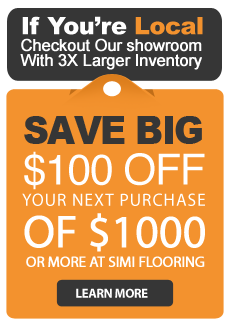 Make sure to research your specific floor’s finish for any ideas. While certain strategies would work for certain finishes, they may not work for others. The advice above however should work for most floors and keep your home looking incredible for longer and longer.